Location: 4 kilometres (2 1/2 miles) west of Lyndhurst. Start: Millyford Bridge car park (SU 268078). Station: Ashurst, 8.5 kilometres (5 1/4 miles). Camping in the Forest campsites: Matley Wood, 7.5 kilometres (4 1/2 miles); Denny Wood, 8.5 kilometres. Car parks near the Canadian Memorial (SU 241094) and close to the Bolderwood Deer Sanctuary (SU 243086). Bolderwood Arboretum Ornamental Drive car parks - Barrow Moor (SU 253067), an unnamed car park at SU 257066), and Knightwood Oak (SU 263063). Also the New Forest Reptile Centre car park (SU 271071) and a car park at Acres Down, off the map a little to the north-east of Wick Wood (SU 266096). Distance: 13 kilometres (8 miles), including a short stretch of the Bolderwood Arboretum Ornamental Drive, 1 kilometre (0.6 miles) along the busy A35 and a short distance along the road close to Millyford Bridge. Moderately hilly. Extend the route: To optionally increase the distance covered, combine this cycle ride with nearby Cycle ride 8 (to the south-west of this ride). 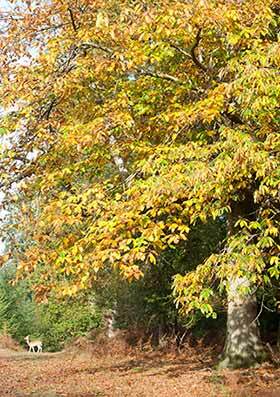 Located a mere 4 kilometres (2 1/2 miles) from Lyndhurst, the start of this ride is in the Millyford Bridge car park, overlooked by magnificent, aged oak and beech trees. High banked, gravel bottomed Highland Water, home to breeding season kingfishers and grey wagtails, passes close to the edge of the car park and is also encountered again part-way around the route. The 13 kilometre (8 mile) route features a number of fairly gentle hills that should not impose too much of a strain on moderately fit cyclists, and includes relatively short sections of road, including one along the often busy A35. Numerous alternative start points are available. Sightings of fallow deer are possible just about anywhere along the route, but particularly in the vicinity of the Bolderwood Deer Sanctuary, which is passed along the way - a short detour will provide good views over the meadows much frequented by these completely wild deer. (Look out in this area for browse lines, horizontal skirts on hollies and other trees, created by browsing deer: they are always a sure indicator of presence). Heathland is crossed near the deer sanctuary, but otherwise this ride is essentially through richly varied woodland, including copious helpings of the historic, open, ancient, unenclosed variety present around Millyford Bridge, in the area around the Deer Sanctuary, at the corner of Mark Ash Wood, alongside the Bolderwood Arboretum Ornamental Drive, and between the A35 and the New Forest Reptile Centre. After passing through open woodland close to the car park, Holmhill Inclosure is entered through a gate. Created in 1815 on the site of ancient woodland interspersed with open areas, probably of heath, lawn and wetter ground, Holmhill Inclosure also took in much of a considerably older enclosure laid out in 1670. One of three unsuccessful attempts to combat anticipated shortages of timber needed for Navy shipbuilding - the other two were at Holidays Hill and Aldridge Hill - part of the old enclosure's hexagonal outline is shown on the cycle ride sketch map. Today, few of the original trees remain, but the substantial surrounding earthen wood-bank can still be seen. Almost beside the route, within Highland Water Inclosure - first enclosed in 1869 - is the site of an old Stag Park, a straight-banked, rectangular-shaped enclosure with external ditch. One of three such parks, its exact purpose remains unclear, although it has been suggested that all were created in the late 17th century to hold red deer recently imported from France. Earthwork remains can still be seen in all three locations, although little is readily visible at the site in Highland Water Inclosure. Shortly after the trees of Highland Water Inclosure are left behind, the Canadian Memorial, a simple roadside Cross, recalls the Second World War contribution of New Forest-based Canadians; whilst a little way further on is the Bolderwood Deer Sanctuary. After a pleasant downhill ride beside on the right a wide expanse of heathland, North Oakley Inclosure, dating back to 1853, is entered followed by Anderwood Inclosure (1811). The Bolderwood Arboretum Ornamental Drive is followed through Knightwood Inclosure (1867), which also features areas of ancient, originally unenclosed woodland, before the famous Knightwood Oak, reputedly the largest oak in the Forest and certainly one of the largest, is passed a short distance away to the left of the route. The A35 is followed for a short distance before ancient, unenclosed woodland is again encountered, this time alongside the track leading to the New Forest Reptile Centre where are housed examples of all the UK's native reptiles. The route beyond the Reptile Centre, through Holidays Hill Inclosure (1811), leads to the Millyford Bridge minor road beside which is situated the Portuguese Fireplace, a substantial flint-faced chimney breast and fireplace retained from a Portuguese cookhouse, and now used to recall the First World War presence of Canadian and Portuguese workers who helped to harvest substantial amounts of local timber for war-time use. Adjacent bumps and hollows mark the site of a Canadian Forestry Corps camp. (Only designated cycle tracks are usually mentioned below and shown on the map (as yellow lines), not footpaths and other tracks. Cycle route marker post numbers are also shown). 1) Leave the car park along the gravel track, and continue through ancient, unenclosed woodland. Cross Highland Water, and pass through a gate into Holmhill Inclosure. 2) After 1 kilometre (0.6 miles), take the right-hand fork at a ‘Y’ junction, and shortly after, go through a gate into Highland Water Inclosure. 3) Immediately turn left at a ‘T’ junction – cycle track sign number 101 – and re-cross Highland Water. Follow the track as it bears right alongside, on the left, the now wooded Woolsmoor Meads. 4) Ignore a cycle track on the left as the track goes uphill, and continue straight ahead to meet a minor road close to the Canadian Memorial – cycle track sign number 105. 5) Cross the road, follow the road to the left for a very short distance and almost immediately leave the road to follow the cycle track to the right. Continue for 1 kilometre (0.6 miles) alongside woodlands, heathlands and wetlands, until North Oakley Inclosure is reached. This is a Conservation Area, so dogs must be kept on leads. The fields of the Bolderwood Deer Sanctuary are on the left, so look out for fallow deer. Notice also on both sides of the track, dense holly holms with trees that show clear browse lines, and multiple shoots that betray past coppicing. There are also examples of hollies that have been relatively recently pollarded. 6) Enter the inclosure through a gate, and after a short distance, take a left turn at a ‘T’ junction, just before a bridge over Bratley Water is reached. Follow the track as it twists first left and then right, and pass a corner of Mark Ash Wood - this ancient, unenclosed woodland contrasts starkly with the inclosure woodland. 7) Continue for just over 1 kilometre, enter Anderwood Inclosure and after just less than 0.5 kilometres (1/3 mile), reach a ‘T’ junction. 8) Turn left, then after a short distance, pass a turn on the right. 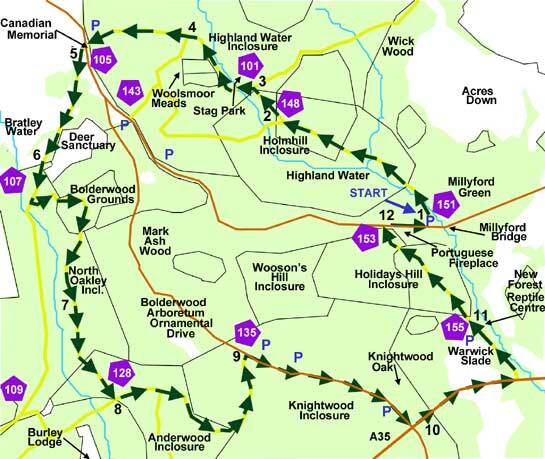 Follow the track for a further 1.5 kilometres (1 mile), at first beside and then, through a gate, into Knightwood Inclosure, to reach the road – the Bolderwood Arboretum Ornamental Drive. 9) Turn right along the road with, initially on either side, ancient, unenclosed woodland left to grow within the inclosure. After a further 1.5 kilometres, the busy A35 is reached, shortly after the Knightwood Oak car park is passed – this famous oak can be seen a short distance along the tracks opposite the car park entrance. 10) Turn left along the A35, and then, after another 1 kilometre (0.6 mile), turn left again onto the track leading to the New Forest Reptile Centre. 11) Pass the New Forest keeper’s cottage, dated 1811, and follow the track as it skirts the Reptile Centre, passes through the car park and continues into Holidays Hill Inclosure. 12) Reach another road and turn right, pass the Portuguese Fireplace, and return to Millyford Bridge.